Knock, Knock… Who’s There? 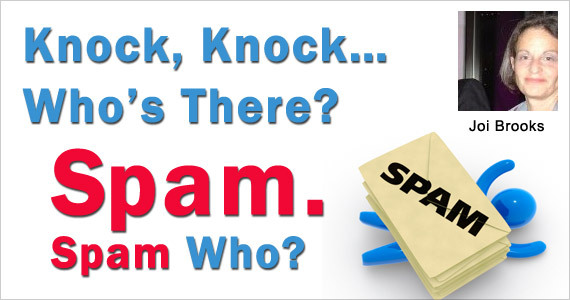 Spam. Spam Who? Some folks never forget a face but have trouble remembering names. Email servers never forget a name but are sight blind and rely on your domain’s good reputation. So, while you are scheduling your editorial calendar, testing subject lines and following best practices without an opt-in or double opt-in process in place, your hard bounces, non-openers and ISP complainers are talking behind your back. Email marketing is based on relationships and expectations. Driving prospects to an opt-in subscription form that communicates what they are signing up for and when they will receive it sets expectations. The double opt-in mechanism doesn’t need to be dry toast. Create your own branded welcome message that both confirms and solidifies your new friendship. Keep your promises and provide your new friends with on-schedule, value-added content. Takeaway: Bad boy comedians draw audiences, but your brand will suffer the consequences from a tarnished reputation. Welcome your opt-ins and you’ll be setting the stage for far greater things to come! Profile: The FlyingDragon provides email services from get to go! With miles of experience, the FlyingDragon will get your email marketing from the drawing board to your subscriber's inbox! From design to best practice, cross-client compliant code, copy editing, metrics, testing, testing, testing 1-2-3, dynamic content... contact the FlyingDragon!